The report includes the weather, seeding percentage and crop growth summaries of five regions within Alberta. Website profiles show where species are likely to be found and how they respond to human activity. Detailed information on hundreds of Alberta plant and animal species is now available online. The Alberta Biodiversity Monitoring Institute — a global leader in biodiversity monitoring — has created the Data & Analytics Portal to provide easy access to the institute’s extensive biodiversity-related data, reports, and maps. Consumers around the world are making their needs very clear when it comes to animal protein. The Nielsen Global Health and Ingredient Sentiment Survey (2016) revealed what folks do not want in food. Surprisingly, the respondent results were consistently universal. Respondents were overwhelmingly concerned and did not want hormones or antibiotics in food in North America (54 per cent), Latin America (59 per cent) and in Europe (65 per cent). Africa and the Middle East had greater concerns than North Americans at 55 per cent of the population shunning food containing or perceived to contain antibiotics or hormones. Continue around the globe to the Global South and 69 per cent of respondents in Asia-Pacific also shun food containing antibiotics or hormones. Three PhD students have invented an edible bale wrap to reduce farm waste. The patent-pending BioNet biopolymer was developed specifically for farms to wrap hay and silage. It is the brainchild of three Imperial College London PhD students: Nick Aristidou, Will Joyce and Stelios Chatzimichail. It’s been grown under water for six weeks at a time, buried under snow for months, and grown in drought conditions in Ontario and Nova Scotia. 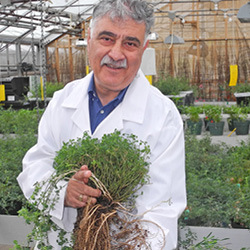 Designed for use across the northern latitudes of North America and Europe, the Rhizomatous Alfalfa variety still known by its experimental name, CRS-1001, has surpassed all expectations in evaluation trials in eastern Canada. It has even shown good seed yield in the Prairie Provinces. Duval County Ranch is located 2 hours south of San Antonio, and covers 125,000 plus contiguous acres. It is located in an arid, mesquite covered region. Along with the mesquite, there are numerous species of brush that cover the landscape. Forage production is limited by the amount of brush cover. The ranch is split by 3 major highways which present another challenge to its management. The ranch is a multi-use operation consisting of grazing mainly stocker cattle, a hunting/wildlife operation, and also oil and mineral production. We know that livestock contribute to GHG emissions. What we don’t know for sure, is exactly how, or to what degree. In this blog post we’re taking a look at a recent study designed to close some of the gaps in our knowledge. In March of this year, Agriculture and Agri-Food Canada in Lethbridge wrapped up a two-year research project, funded by the Alberta Livestock and Meat Agency (ALMA). The project is helping us understand more about ammonia and related emissions from feedlots, so that the industry can adjust accordingly, and more knowledgeably inform public policy. Last week on this blog we talked about a research project that is helping us understand the greenhouse gas emissions from feedlots. We explained why the project was needed and what it studied. This week we continue our conversation with Dr. Sean McGinn of Agriculture and Agri-Food Canada to find out how the study will help Canada’s cattle feeders minimize their impact on the environment. Fluctuating prices and demand, coupled with improved production efficiencies, continued to shape the livestock sector in 2016. ARECA Meets With the Honourable Oneil Carlier, Minister of Agriculture and Forestry! Grey Wooded forage Association is pleased to announce Ginette Boucher as our new General Manager!